A uterine myoma (also called fibroid, leiomyoma, leiomyomata, and fibromyoma) is a benign (non-cancerous) tumour that grows within the muscle tissue of the uterus. There can either be one dominant myoma in the uterus, or a cluster of many small myomas. Uterine myoma range in size from larger than a melon to as small as a coin. 20-50% of women of childbearing age have uterine myoma. While many women do not experience any problems, symptoms can be severe enough to require treatment. 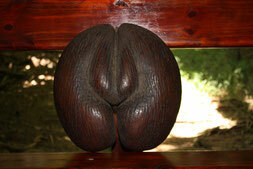 For example, a very large myoma may cause the uterus to stretch to the size of a six or seven-month pregnancy. 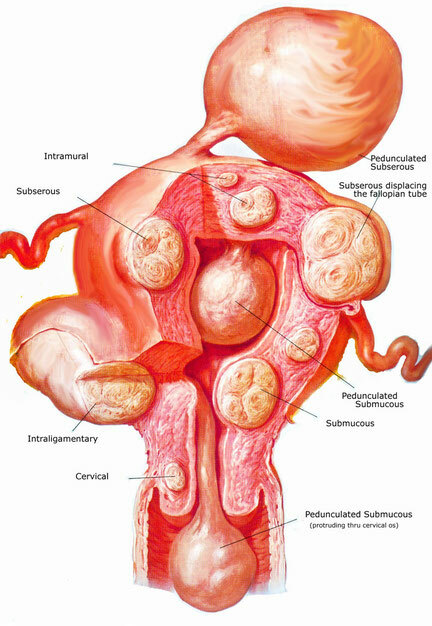 Subserosal - These fibroids develop in the outer portion of the uterus and continue to grow outward. Intramural - The most common type of myoma. These develop within the uterine wall and expand making the uterus feel larger than normal (which may cause "bulk symptoms"). Submucosal - These myoma develop just under the lining of the uterine cavity. These are the myoma that have the most effect on heavy menstrual bleeding and the ones that can cause problems with infertility and miscarriage. Pedunculated Myoma - Fibroids that grow on a small stalk that connects them to the inner or outer wall of the uterus. What are commom symptoms of uterine myoma? How do I know if I have uterine myoma? When visiting your doctor to investigate these symptoms, your doctor will check the size of your uterus. If it feels enlarged, your doctor may order an ultrasound or a magnetic resonance imaging (MRI) session to confirm the presence, location and size of the myoma. If the doctor diagnoses your condition to be caused by myoma and based on the size and location of your myoma, treatment options will be advised to you. If you do not experience any symptoms caused by the myoma, there is no need to treat them. Your doctor may want to watch them and check for any further growth.